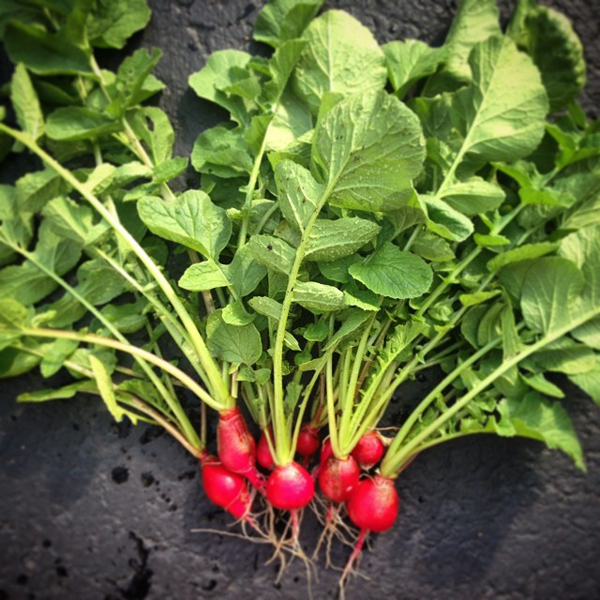 The first thing out of our garden this summer is radishes. I have been waiting for this radishes ever since I read that the thing to do with radishes... is to eat them with butter and salt! It sounds odd, but I love trying odd combos. (honey on pizza and ketchup on mac & cheese for instance) It sort of makes sense... the butter tames the bite of a radish. Salt enhances the flavor. Really you can just serve them with butter, a dish of salt and slices of bread. Or smear the butter on the radishes and dip them in salt. I like this method of wedging a bit of butter into a slice cut into the radishes. 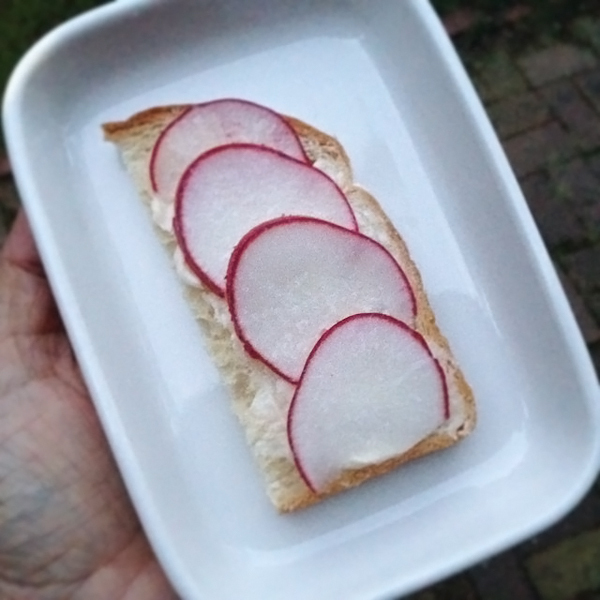 Or go all out and make a radish, butter and salt sandwich. That is what I did but with just regular bread. It really is tasty. A nice alternative for our garden radishes. This is how I eat my radishes, too! Extra delicious with thinly sliced scallions on top. Oooh I'll have to try it with scallions! Roast them and stir-fry the leaves! It sounds crazy but they are so good like that. I slice the radishes themselves in half, toss them with kosher salt and olive oil and roast them on a cookie sheet with sweet potato and beets. The leaves stir-fry really well and turn into something like spinach.